Thanksgiving Nuggets: Stay Calm, Becoming, and Get Yours! I hope that this coming week will be one of rest and Thanksgiving (for our U.S. Charisse Says members). First, know that I am especially grateful for you, and I appreciate your continued engagement and readership. Ultimately, I trust that these nuggets of advice contribute to your life and wealth in a positive manner. The jockeying reflects widespread expectations that economic momentum will slow as factors like wage growth, rising interest rates and a stronger dollar take more of a toll on profits, analysts and investors say. 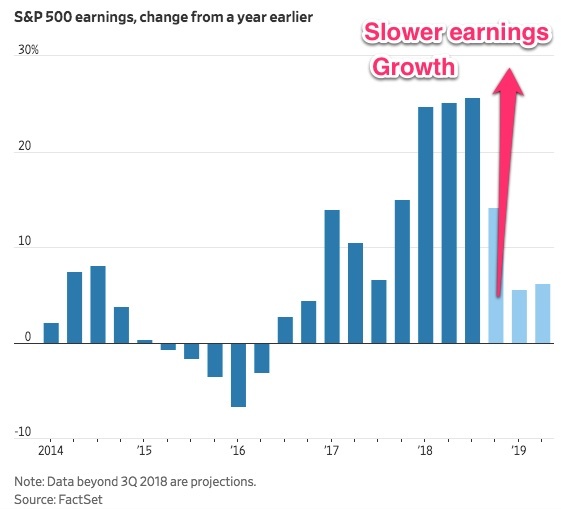 Remember, strong earnings growth tends to drive stock prices upward. As a result, one can conclude that a lot of the easy money in the stock market has already been made. I agree with such a conclusion. As such, keep asking yourself – Am I overly exposed to U.S. stock markets? Do I own any stocks that are experiencing a slowdown in earnings growth?, and Is there an opportunity to take profits with my winners? Becoming Is a True Wealth Statement. Have you gotten your copy of Michelle Obama’s Becoming? Well, I have my Audible version, and I’m excited to listen. Stay tuned for more commentary once I’m done. Outside of simply being inspired by Michelle Obama, it’s important to recognize the wealth building strategy inherent in her actions. What I mean is that through her books, speaking engagements, and brand-building activities, she is cementing generational wealth. Few of us will have the opportunity to follow in this exact strategy, BUT, I call it out to remind us to find our own way. How are you using your own platform and skill sets to generate wealth for yourself and your family? What can you learn from Michelle Obama’s words? Don’t Forget Your Year-End Tax Tips. TurboTax released its “Top 8 Year-End Tax Tips.” My two favorites are: (1) Take some last minute tax deductions, and (2) Watch your flexible spending accounts. But, make sure you check out all 8 because there’s just over a month in this calendar year to get it together and most likely, save you money. If you’re off this week and can spend just an hour planning out how you will take advantage of some tax benefits, I guarantee the time will pay for itself! Way to go Vanessa for having a stash on hand! Do you have a success story that you want to share with the community? Share your story in the comments below. And, let’s keep praying for the families in CA deeply affected by the fires. That’s it, for now! Have a wonderful week and enjoy your Thanksgiving.